The next edition of Father Facts is here! 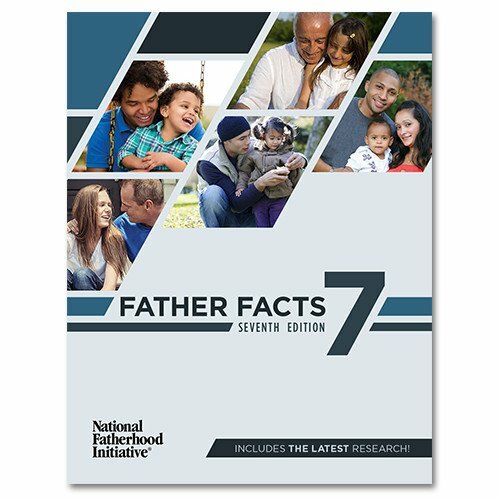 Father Facts 7 continues the tradition of National Fatherhood Initiative (NFI) providing the most comprehensive resource on research on father absence and involvement. I'm very excited about Father Facts 7 because it includes nearly 200 new studies (197, to be exact). That’s a lot of new studies since we published Father Facts 6 in 2011. It also contains 14 new chapters and sections! They include state level data on father absence (which compliments the national data Father Facts has always included), the impact of father involvement on women's/mother's well-being, the societal costs of father absence, the biological connection between fathers and children, grandfathers raising grandchildren, and so much more. An introduction to each section that describes its relevance—why it’s important. A summary of the research and data in each section and subsection that describes what we know and don’t know about the subject/topic of the section or subsection. You don’t have to read every entry and decide what the research and data indicate. Research and data are organized in descending chronological order so it’s easy to find the most recent research and data. The electronic format is easy to search for the topics, research, and data you need. It also makes it easy to cut and paste research and data—and even the summaries—into research papers, proposals, presentations, emails, etc. It’s also more convenient to acquire! Just purchase it here, receive the link to download it, and you’ll have it in no time. I’d be remiss if I didn’t thank everyone who helped NFI create this new edition. I had the privilege of working with Dr. Jay Fagan of Temple University, one of the country's leading researchers on father involvement, and three of his graduate students—Jessica DeMarchis, Adina Freedman, and Mollie Cherson—to identify studies and data, published since our last edition in 2010, that increase our understanding of just how important fathers are to families, children, and our country. Their contribution was enormous, and I can't thank them enough. Have you downloaded the sample? Get the sample here or visit here for purchasing. Please tell us what you think about this helpful resource and how it will help you in the comments of this post.